Democratic congressional candidate Marjorie Margolies held a fundraiser with several national and state political heavyweights last week, as she campaigns to regain her seat from the early 90s. The event, a breakfast held at the Philadelphia office of the law firm Stradley Ronon, took place on February 7th. 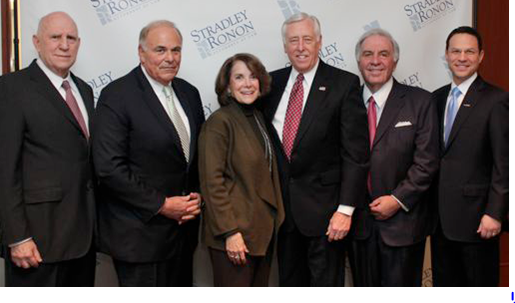 The headline guest was House Minority Whip Steny Hoyer. Apparently, Hoyer was in the midst of a weekend swing through southeast PA as he also stopped by Kevin Strouse’s Bristol campaign office the next morning. Hoyer spoke to the assembled group at the firm’s headquarters and took questions from the attendees. Most intriguing, however, is the photo the law firm released of the event which shows Margolies, Hoyer, members of Stradley Ronon, and former Governor Ed Rendell. The popular Democrat has not endorsed any candidate in the race, and it isn’t clear this constitutes any sort of endorsement, yet his appearance with Margolies is sure to distress her opponents. The photo also shows popular Democrat and potential 2016 Senate candidate Josh Shapiro. Like Rendell, he hasn’t made any official endorsement in the race, but his attendance at a Margolies fundraiser may be an informal one. Despite raising more than her competition in the fourth quarter of last year, $211K, Margolies spent more than she raised for a difference of -$14,000. That was the second quarter in a row where Margolies had an unparalleled burn rate. In the 3rd quarter, of the $237K she brought in, she spent $205K – a burn rate of 86%. Other Democratic candidates in PA-13 include physician/activist Val Arkoosh, State Rep. Brendan Boyle and State Sen. Daylin Leach. The latest available polling in the race was done by the Margolies campaign back in August. It showed Margolies at 43%, followed by state Rep. Brendan Boyle (D-Phila) at 15%, state Sen. Daylin Leach (D-Montco) at 7% and physician Valerie Arkoosh at 2%. 31% were undecided. Wouldn’t it be nice to elect a representative not by who they know or what they did 20 years ago, but by what they stand for? But I don’t know what Marj stands for because she doesn’t speak to the public. Why is that? It is apparent the Democratic leadership in Congress is selecting candidates it believes can aid their ability to take back congress. It is also apparent that these may be candidates who seem to be more of the Blue Dog variety than many progressives would like to see. As far as Governor Rendell goes he is in the photograph but I don’t believe that if he wants to remain an MSNBC contributor he can actually endorse anyone. But with the number of democrats seeking this seat Ms. Margolies has a good chance to win by virtue of who supports her in this race. Her connections to Clinton and the establishment are many, even if her involvement in Democratic politics in the last many years has been little noticed. Hopefully she got some good tips. Average age of the picture sans shapiro is about 67. Also, is that a former pa state GOP chair in the picture? MMM can bring them together. She spends everything she takes in as fast as she can. Why would anyone donate to that campaign? Shapiro’s fellow Montgomery County Commissioner, Leslie Richards, is supporting Marjorie Margolies. Shapiro also is Counsel at Stradley Ronon, so appearing in a photo with Margolies does not mean he is supporting Margolies. But the fact that Shapiro, a savvy politician, allowed himself to be photographed with her at a high profile fundraiser for her does not mean he is not supporting her.